The enjoy-to-make two-ingredient balsamic-maple glaze adds a little extra oomph! The sweet and tangy glaze goes great with the savoury flavour of Brussels sprouts. It's also vegan and gluten-free for those of you with dietary restrictions. Preheat oven to 425°F and line a baking sheet with aluminum foil. In a large bowl, toss Brussels sprouts in olive oil, salt and black pepper. Place Brussels sprouts on the baking sheet in a single layer and roast for 25-30 minutes; stirring and rotating the baking sheet halfway through. Meanwhile, prepare the balsamic-maple glaze. Heat a small saucepan under medium-high. Add balsamic vinegar, maple syrup, and a small pinch of salt. Stir frequently until the sauce thickens and glaze forms, about 4-5 minutes. Drizzle Brussels sprouts with the glaze. Salt and pepper to taste. Serve immediately. 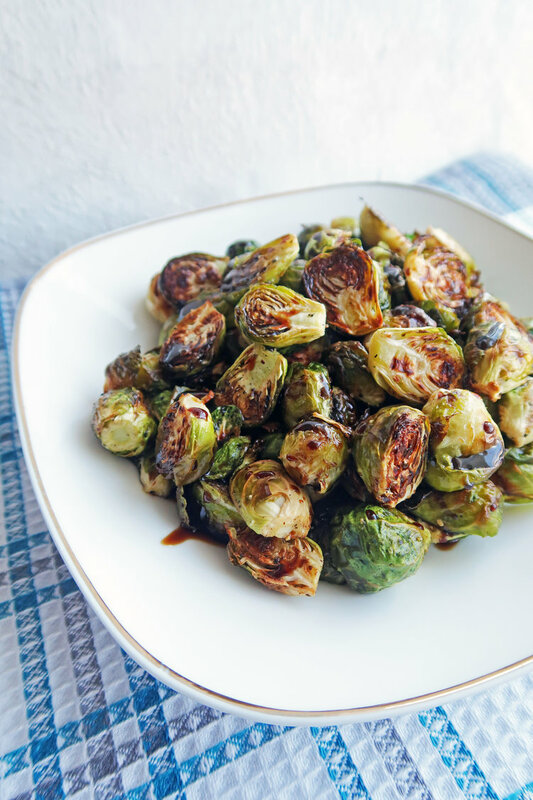 Adapted from Kevin is Cooking's Honey Balsamic Roasted Brussels Sprouts and WeightWatcher's Roasted Brussels Sprouts with Maple Balsamic Drizzle. When picking Brussels sprouts, make sure they are firm, compact, and bright green. The smaller Brussels sprouts are often more tender and flavourful. If the glaze gets too thick, add a little more balsamic vinegar to the saucepan at medium-high heat and whisk until you get your desired consistency. 0 Response to "ROASTED BRUSSELS SPROUTS WITH BALSAMIC-MAPLE GLAZE"